Senator Roland Burris' confidants say he was unprepared from a public relations and political perspective to deal with the national media frenzy and ethics problems he now confronts. 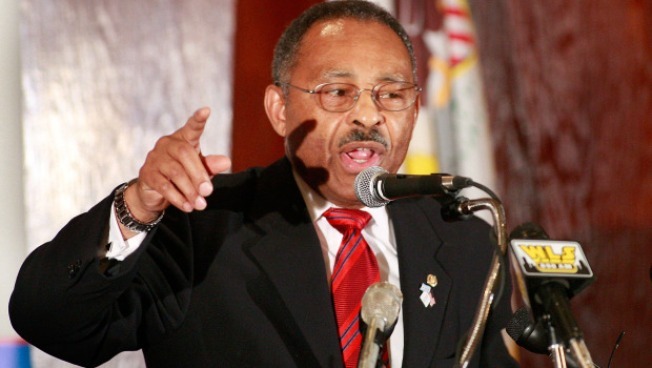 CHICAGO — The crisis now threatening Sen. Roland Burris’ political career started with revelations about his entanglements with disgraced former Illinois Gov. Rod Blagojevich. Against this backdrop, Burris and his team continue to fight calls for his resignation, saying doing so would be an admission of guilt when they believe they were guilty only of a poor strategy. Burris, who returns to Washington this week, believes that the worst political hits are behind him, and he plans to continue to build his Senate office by bringing in new staff. One Burris source said the Democrats who cast quick public judgments are eager to push the him aside because of resentment over how he got seated — Burris faced stiff Democratic objections last month, and many Illinois Democrats already fear he’d be a weak 2010 candidate. “I don’t think they wanted him to represent the state of Illinois ... this has been an onslaught,” the insider said. But his team lacked the PR infrastructure and the foresight to get ahead of the story and didn’t realize the gravity of the first revelation. Indeed, Burris and his staff were not too concerned about a Chicago Sun Times report Feb. 14 that Blagojevich’s brother had asked the senator to raise money for the governor. Burris also told the paper he had submitted a Feb. 5 affidavit laying out all his contacts with Blagojevich associates, admitting much more extensive contacts with the ousted governor than he had laid out in his sworn testimony during the governor’s impeachment proceedings on Jan. 8 and the first affidavit he submitted on Jan. 5. Burris didn’t believe these revelations to be a bombshell, and he mentioned the situation only in passing to both Senate Majority Leader Harry Reid, and the state’s senior senator, Richard J. Durbin, on the Senate floor Feb. 13. Burris didn’t even give Durbin the affidavit before the senior senator left on a weeklong Senate trip abroad. But the Feb. 14 report suddenly dominated the news, and Burris’ team hastily arranged a Feb. 15 press conference to argue he had been consistent in all his statements and drafted the affidavit after reviewing his previous statements. But that turned into a combative appearance, with Burris struggling to explain the distinction he was trying to make between expressing passing interest in the Senate seat and lobbying to get the appointment. Burris also seems to have erred in having his attorney, Timothy Wright, stand behind him to help answer questions, which created an appearance that he had done something wrong. “Bad idea,” said one Chicago Democratic politician. “They are used to playing fast and loose in Chicago, but that doesn’t work here [in the Senate],” said one Democratic Senate aide. Then on Feb. 16 in Peoria, Ill., Burris answered many reporters’ questions, but he let slip a revelation that caught his team completely unprepared: that he actually tried to raise money for the governor at the same time he was expressing interest in the Senate seat. With that, the Senate Ethics Committee decided to start an inquiry, and a perjury investigation was launched in Illinois. Some of Burris’ advisers wanted to counter the frenzy with a public-relations blitz, including putting together an extensive timeline of everything Burris did to get the Senate seat, in an effort to show that all of his contacts with Blagojevich were completely innocuous. But the legal team wanted Burris to keep quiet, so the senator cut short questions at his Feb. 18 speech at the City Club of Chicago, and he refused to speak to the media for the rest of the week. But pressure kept building on Burris daily. On Feb. 18, Durbin told the Tribune that Burris’ future was “in question,” and on Feb. 19, he told the Sun Times that Burris was extending the “Blagojevich burlesque.” On Feb. 20, Gov. Pat Quinn called on Burris to resign. There will be another fresh frenzy this week — the Washington press corps will descend on the senator with every entry and exit from the Capitol building, and any comments he makes will be scrutinized not only by the media but also by ethics investigators in the Senate and legal officials in Illinois.